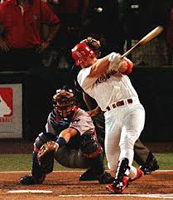 Mark McGwire was one of the most feared baseball players at the plate in the history of the game. Few players have dominated the field at the plate like McGwire did in a career that spanned decades and a variety of teams. He first became known for wearing an Oakland A’s uniform and then electrified the entire nation in his pursuit of the single-season home run record in 1998 by competing neck and neck against Sammy Sosa of the Chicago Cubs. McGwire was known for his physique as much as his skills. He was, and still is, a massively muscular man. He was known to use that physique when he was at bat, capable of belting a ball out of some of the largest baseball stadiums in the country. He started his career in in 1986 by playing for the As and then finished his career in a St. Louis Cardinals uniform and ended his career in 2001. In that time he racked up numbers that have made him Hall of Fame worthy. For example, he beat Roger Maris single-season home run record by hitting 70 home runs in 1998. He ended his career with a total of 583 homers and a career batting average of .263. He also notched 1,414 RBI. He was a 12-time All Star and two-time World Series champ. He won a Golden Glove for his field work in 1990 and the Silver Slugger Award three times. He was the American League Rookie of the Year in 1987 and won the Home Run Derby in 1992. These days he is still active as the hitting coach for the Dodgers. While there were controversies and accusations thrown his way during his career on the field and in his time off the field, the fact remains that Mark McGwire has been a beloved player both on and off the field. One of the things that has truly endeared him to many is his care for children and for founding the Mark McGwire Foundation for Children http://www.mcgwire.com/charity.html. Mark and his wife, Stephanie, formed the foundation with the goal of focusing on children who have suffered through, and continue to live with, the trauma involved in being sexually and physically abused. The foundation donates to medical and mental health facilities that focus on helping children who have been sexually and physically abused so that they can cope with the trauma involved and still have a relatively normal childhood. The foundations does not focus on just one facility, but spreads the money around to several that deal with this very important and troubling problem. In recent years McGwire has also been working with the National Kidney Foundation. He donates to them to help children who have a problem with bed wetting and other problems. 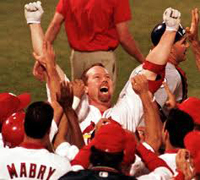 Mark McGwire was one of the most recognizable and fan-loved players on the field during his playing days. However, years later, after his retirement, he has not forgotten to give back to the fans and the community. By setting up his charity foundation, he has found a way to give money back to children and families and fight a number of causes and concerns that affect the lives of children everywhere. He is still slugging away, but now he is doing it on behalf of families and their children.